In recognition of Canada’s 150th anniversary, TD has teamed up with many Canadian municipalities to revitalize 150+ green spaces across Canada, to bring communities together. They’re calling this initiative the TD Common Ground Project. Click here for more information about this national project. Kingston’s Victoria Park has been chosen as one location to get substantial upgrades. Victoria Park was formally established by the City of Kingston in 1892 although the area had been in use as a public space since 1877. The city chose to name the park after Queen Victoria. Victoria Park is centrally located in a heavily populated area of Kingston. Many families and students live in very close proximity to the park. When I went to Queen’s University I walked through this historic park every day to get to classes. It’s a great place to gather with friends in the city. It’s a beautifully shaded park with a few great amenities. In the winter the city maintains ice surfaces in the park, and there’s a baseball diamond. These features will stay the same after the renovation is complete. The city is upgrading the water feature and the play courts (basketball and tennis) as well as adding BBQ stations and more park benches. I understand there are going to be more trees planted as well. I have to say this is already a well-treed municipal park! My kids and I went to the park to see if we could envision the end result. They’ve removed the wading pool, which had been a feature of this park since well before my time, and are installing a “water feature” which is basically a large splash pad. Thanks to the grant from TD, the city is able to make the water feature larger and install a water conservation garden to help manage the water runoff from the splash pad. The construction is already well on its way. When we visited in late April the new basketball pad and tennis court were in, and it looked to me as though the pipes are now in place for the new water system. The project manager at City Hall told me they’re hoping to have a grand opening in mid to late July. From my vantage point that looks like it should work out! If you’re interested in reading more on the project from the City of Kingston website, visit this link. My kids are dying to check out this new splash pad. I had to tell Rose that it won’t be ready for a while yet, but that we would be visiting once it’s ready. In fact, with new BBQ areas we could invite some friends and make a full day of it! I would especially love bringing my camera and getting up close with the water conservation garden. I try hard to be a green thumb, and anything that’s environmentally sustainable is of interest to me. Kingston is very historically significant, and being able to upgrade Victoria Park will help bring the local community together. There has not been a large scale upgrade to this park since the 1970s, although the newer play structure was installed in 2007. Victoria Park is such a large space I can envision many different aspects of the park being used simultaneously, but also not interfering with each other. The play structure is near to the water feature, so families with young ones will gather there, while the BBQ area is sufficiently far away to not be a hazard to wild young children intent on having fun. The open spaces and baseball diamond are also sufficiently far that there should not be too many stray fly balls or Frisbees bothering either the BBQ users or the water play-ers. I had forgotten (15 years post-graduation!) just how large and sprawling this downtown park really is. I see many more generations of families enjoying this park once it is fully revitalized. I look forward to creating a follow-up post in the fall when the project is complete and I’ve had a chance to visit Victoria Park with my family and friends. Hopefully it will be more photogenic then! Do you have any memories or stories about visiting Victoria Park? I’d love to hear them – please share with me in the comments below! It really does give back to everyone. I’m very excited to see the end product later this summer. Thanks for your comment Carol! How great that you’ve visited Victoria Park! I was surprised to read that actually. I truly hope you family is able to enjoy the renovated park later this year. Kingston is a beautiful city – I feel very fortunate to live here. Thank you for your comment! Renovating and updating parks is a wonderful contribution to Canada’s 150th and hats off to TD and Kingston for doing this. I have actually been a bit disappointed that there isn’t a lot more hoopla to celebrate this anniversary. It is left to every municipality to decide how they’re going to celebrate and not everyone is creative enough to make an impression. Therefore Be Proud of Kingston for creating memories. I definitely agree. I’m still surprised Kingston was chosen as a location for this Common Ground project. We plan to take advantage of this revitalization later on this summer. Thanks for your comment! Hi I’m stopping in from Fortheloveto link up. This is so awesome for your community. Splash pads are our fave during the warmer months. My kids love splash pads too. I’m excited to see how this design turns out! Thanks for the comment. That is really cool. More places need to that. A park is a great way to have some family/friend time for a nice Sunday bbq or lunch and just play, have fun and be kids again. Victoria Park seems like it will be a great spot to visit once it is ready. I really like that they didn’t have to block off the kids play area while they are working on the new pieces. 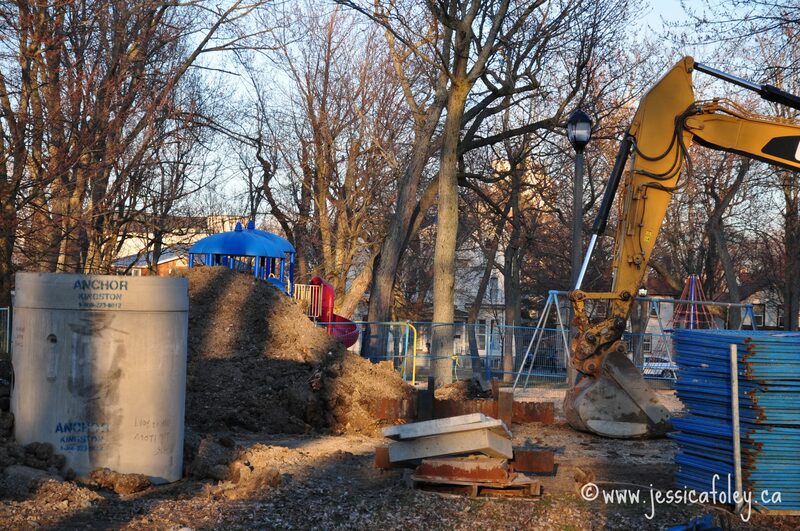 It means families can still enjoy the park while they wait for the new water feature! Thanks for stopping by Emily! I’m glad to hear you are living where you feel comfortable. Nature is important to me too. Thanks for the comment! Well be sure to check back later this summer to see how the plans turned out! This is an awesome project for the community as well… More countries should learn from this. Thanks you for join us at #alittlebitofeverything. Thanks Iveth! I’ll try to remember to link up the finished project post as well – so you can see how it turned out! I grew up, and go back on the weekends, to my house just on the other side of the New York border. I grew up on Canadian TV, more than US ones (Mr. Dress Up, Friendly Giant etc). I am glad to see the renovations, I hope to come to Kingston soon. Well if you come for a visit later this summer you should stop by Victoria Park and check out the upgrades! PS – I love the Friendly Giant and Mr. Dress Up! I have never visited Victoria Park or Canada for that matter. It sounds like the ideal place to spend the day with family especially as it has a bbq area. I look forward to seeing the end result! I’m looking forward to it too Phoenicia! I hope I can get some great photos of the park when it’s all ready. Thanks for the comment! Hi Jessica, it’s always nice when a place is revamped. It sounds as if Victoria park will continue to be enjoyed for many years to come. It is nice, isn’t it? I can’t wait to see the finished product! I hope we can take the girls and enjoy the park for years to come. Glad to hear the kids are enjoying the revamped spaces. It’s so great to encourage kids to spend as much time as possible outdoors. Thanks for the comment! It’s an amazing project, Su. I’m glad my community was chosen for the grant to help celebrate Canada’s birthday! Park time is a lot of fun. I’m looking forward to seeing how this gift to the city plays out. Thanks for the comment! I sure am! And I hate the wood chips too – they have them at my kids school and they drive me crazy! Wow so many comments! We are very excited about this project and happy to have been part of the promotion team! We should plan a family picnic together sometime this summer! #bloggersunite haha!